Can Kylian Mbappe beat both Messi and Ronaldo for the Golden Shoe? As we move towards the latter stages of the season, forwards from each of the top European leagues are trying everything they can to propel their teams forward, bagging as many goals as possible. That naturally makes them strong contenders in the race for the European Golden Shoe. Last season's runner-ups, Mohamed Salah and Harry Kane, are nowhere near the top three candidates in the 2018-19 season. But Lionel Messi has carried forward his form and is leading the race to defend the top-scorers' crown amongst the top European leagues. Messi won the 2017-18 Golden Shoe as he ended his LaLiga season with an unbelievable tally of 34 goals in just 36 appearances for FC Barcelona. With 25 goals registered to his name this season, the Argentine forward is currently leading the race this season as well. The 31-year-old currently owns one more Golden Shoe than his fierce rival Cristiano Ronaldo. Closely chasing the five-time Golden Shoe winner, Kylian Mbappe has scored an exceptional 22 Ligue 1 goals so far. Since the start of the season, the Frenchman has been carrying PSG's attack and has bagged more goals than Neymar Jr and Edinson Cavani. The 19-year-old has taken the football world by storm and is fighting with two of the footballing greats, Ronaldo and Messi, for the Golden Shoe this season. Mbappe made history as he scored four goals in just 13 minutes against Lyon in early October. Ronaldo, who moved to Juventus after spending nine seasons with Spanish giants Real Madrid, currently ranks third in the Golden Shoe race. Following a steady start to his maiden Serie A season, the 34-year-old has lit up the Italian league with his typical stellar form. With 19 goals registered to his name so far, the Portuguese forward is the leading top-scorer in Serie A.
Ronaldo's departure to Turin might have ended his rivalry with Messi on the club level. However, the two forwards have shown no signs of slowing down, even after the Ballon d'Or 2018 snub. And now, leading the goalscoring charts in their respective leagues, both are in contention for the European Golden Shoe. On the other hand, Manchester City's Sergio Aguero and AC Milan's Krzysztof Piatek are rapidly inching closer towards the top three candidates. 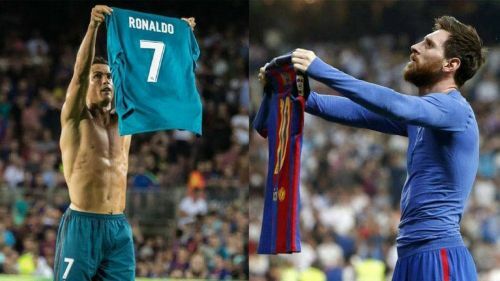 While Ronaldo's departure from LaLiga has left Messi to gain sheer dominance over the goalscoring chart, his former club Real Madrid have failed to replace him with a top-notch goalscorer and have struggled since the start of the season. As Real Madrid continue their horrendous season in Ronaldo's absence, they face FC Barcelona in their next game at the Santiago de Bernabeu. While Ronaldo won't be there to save the day for the hosts, Messi would look to extend his goalscoring tally against their bitter rivals and try to hold a firm grip over the Golden Shoe.